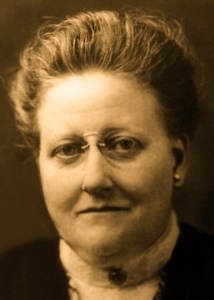 A Year of Being Here: Amy Lowell: "Bath"
The sunshine pours in at the bath-room window and bores through the water in the bath-tub in lathes and planes of greenish-white. It cleaves the water into flaws like a jewel, and cracks it to bright light. Little spots of sunshine lie on the surface of the water and dance, dance, and their reflections wobble deliciously over the ceiling; a stir of my finger sets them whirring, reeling. I move a foot and the planes of light in the water jar. I lie back and laugh, and let the green-white water, the sun-flawed beryl water, flow over me. The day is almost too bright to bear, the green water covers me from the too bright day. I will lie here awhile and play with the water and the sun spots. The sky is blue and high. A crow flaps by the window, and there is a whiff of tulips and narcissus in the air. "Bath" by Amy Lowell. Text as published in Selected Poems of Amy Lowell, edited by Melissa Bradshaw and Adrienne Munich (Rutgers University Press, 2002). 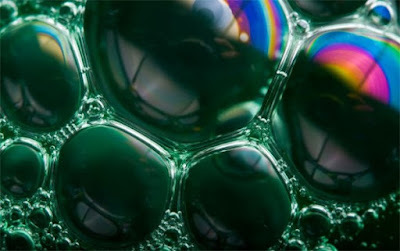 Art credit: "Iridescent Green Soap Bubbles Background," image by unknown photographer.